ObjectSecurity, an information security leader and the leading security policy automation company globally, today announced that hi-tech industry veteran Bruce D. Roberts will be joining ObjectSecurity as board advisor. The new board advisor will assist ObjectSecurity in raising growth capital, and will be advising on business and technology strategy. Bruce Roberts has 50 years of experience in Aerospace and Defense with General Electric, Unisys, SAIC and Cubic. He is currently on call with Cubic and involved with multiple non-profits in the San Diego region including CommNexus, The Security Network, The Maritime Alliance, Cyber Security Institute of San Diego, Securing our eCity and the San Diego Advanced Defense Technology. He has a Masters in Systems Engineering from University of Florida. Bruce is currently consulting for Cubic Corporation while being actively engaged in the regional cyber initiative. He is a founder and board member of the Cyber Security Institute of an Diego and active with SOeC and SDRIC as well as a co-chair of the Military and Security SIGs for CommNexus and has been a mentor for EvoNexus. 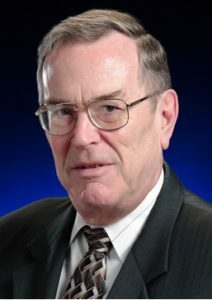 Bruce D. Roberts retired from Cubic after more than 50 years experience in the Aerospace and Defense industries as the Senior Vice President of Security Programs for Cubic Corporation. He was previously the Sr. VP Technology and Advanced Development for Cubic Defense Applications (CDA). He joined the company in May 1997. Prior to the reorganization and consolidation of the defense subsidiaries to form CDA, Roberts held the position of President and Chief Executive Officer of Cubic Defense Systems, Inc. He also served as Vice President and MILES 2000 Program Director. Before joining Cubic, Roberts was Senior Vice President and group manager with Science Applications International Corp. (SAIC). He previously held executive positions with Unisys Corp. and General Electric. He served as a Trustee for the National Defense Industry Association while at Cubic and a member of the Industrial Executive Subcommittee of the NSTAC (National Security Telecommunications Advisory Committee) while with Unisys. Roberts is a graduate of St. Lawrence University in Canton, N.Y., where he obtained his Bachelor of Science Degree in mathematics with physics and economics minors. He obtained his Master’s Degree in Systems Engineering from the University of Florida.